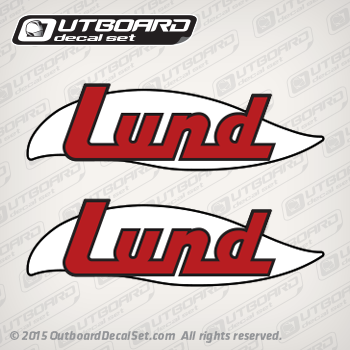 Lund Logo decal for Lund Boat decals 1974 1975 1976 1977 and others. 1974 1975 1976 1977 Lund Boat decals and other years. This decals are not been consistent used on an specific generation they may work on other Lund Boat Generations. Sold by the set of 2 decal labels. One decal goes on the Hull rear Port Side of Lund Boat and the other is usually installed on the opposite (starboard) side Rear part of the boat.